It’s hard enough for a teenage girl to bear the embarrassment of having been abandoned by her mother and having to help care for a younger sister. Then, when Papa insists that they move to join his family in a little town in Arizona and rent a haunted house on the other side of the tracks, Elena simply can’t face the shame. She feels she will never recover from the spooky goings-on in that old house, or the illness that results from her brush with the world of the dead, until Grandmother shares her wisdom about ghosts. Elena’s Papa has spent a week in the house by himself, on the promise that they can occupy the place rent-free for six months. Elena is old enough to understand that her father is scrambling to make enough of a living to rent a better place. So when he persuades her that there is nothing to fear, what can she do? She can’t let Papa think she’s a scaredy-cat like her little sister, or that she isn’t willing to do her share. But Papa is wrong. When Elena actually sees the ghost, she is smart and lucky enough to remember the advice of her abuela. She is also courageous enough to speak directly to the ghost, who turns out to be a girl her own age. The story unfolds with a poignant tale of a young girl’s desperate actions in the face of poverty and disappointment, a story that includes buried treasure, the resolution of a family’s tragic misunderstandings, and a happy outcome for Elena and her family. Simple black-and-white drawings throughout this bilingual book make it an easy page-turner and point up the important moral lessons included in the story. Fortunately, those moral lessons are based on compassion, tenderness, and hope, rather than dwelling on guilt and fear. 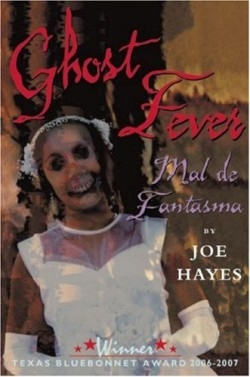 Hayes’s experience and friendship with the Latino community make his work both authentic and engaging.